The exact nature of a Czech-run camp where hundreds of Romamainly childrendied from disease, hunger or abuse during the German occupation has long been a polarising issue for the nation's politicians. But the stench of the pig farm built above the mass graves of the Lety u Pisku "concentration camp" back in the 1970s has now, metaphorically speaking, travelled all the way to Brussels. The Czech Republic has been singled out in a European Parliament resolution for failing to remove the pig farm and create "a graceful memorial" to honour victims of the Romani Holocaust. "In the name of the Father, the Son, and the Holy Ghost..."
A catholic priest recites a solemn prayer on Friday for "our Romani brothers and sisters"--the 85 men and women, and 241 children who died at Lety u Pisku, and for the thousands of other Czech Roma killed in the Holocaust. The ceremony took place on the site of the camp's temporary prison cemetery. 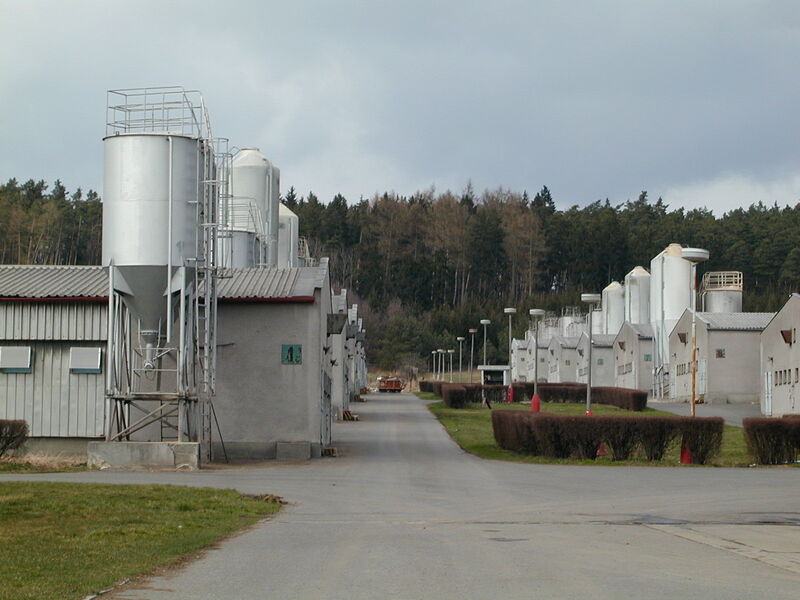 The actual camp site, a couple of hundred meters away, is now home to an industrial pig farm built under Communism. Among those paying tribute to the victims was Jan Vrba, now 63, who was born in the Lety camp, and whose only sister and grandfather died there. "I know from my parents that it was a place of cruelty; that starving children were eating raw cabbage from the fields, and that the townspeople from Lety paid no attention to them. Small children were dying on piles ofI don't want to say itpiles of excrement. My parents managed to protect me and my brother, so that we survived. But I lost my sister here and my grandfather. Lety must be as a memorial!" A memorial has yet to be built on the actual site of the Lety camp. In recent years, the owners of the pig farm built above it have taken to shutting off the ventilation system every May 13 for these annual services. The owners are well aware that the stench of the penned-up animals casts a pall over the memorial event and makes for bad press. "Stench of Czech pig farm reaches Brussels" was the headline in the leading Czech daily Mlada fronta Dnes following the April 28 vote in the European Parliament on a Resolution that singled out the Czech Republic for failing to honour Romani victims of the Holocaust. "This resolution is very important for the almost 15 million people who live in Europe as Roma. This is the first document which is speaking about forced sterilisations, and such things like what happened in Lety, where the pig farm was built at the site of the concentration camp", says Victoria Mohacsi, an MEP from Hungary and one of two Roma elected to the European Parliament. "This is the first document that is speaking about the details of the discrimination against the Roma." The resolution stresses that the Romani Holocaust deserves "full recognition, commensurate with the gravity of Nazi crimes designed to physically eliminate the Roma of Europe as well as the Jews" and calls on domestic authorities "to take all the necessary steps to abolish the pig-fattening industry on the territory of the former concentration camp in Lety (Czech Republic) and create a graceful memorial". 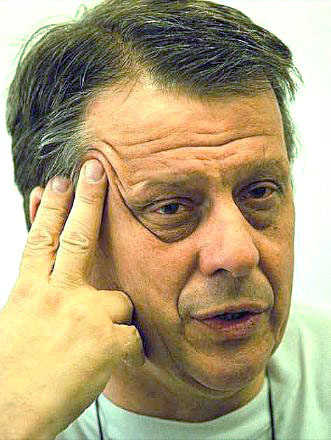 "It's more than symbolism, not just the Resolution, but this paragraph itself, on Lety, because with this text, we could go to the Prime Minister, we could go to that minister of state secretary who is dealing with the Holocaust issue, or cultural issues, and say that this is the European wish; this is what the Members of the European Parliament are asking for you to do, to feel responsibility. It is not possible to create a pig farm on this field where hundreds of people were killed in a concentration camp, or died in a concentration camp." Not even ten percent of the 6,000 to 8,000 Roma living in the Czech lands in 1942 are thought to have survived the war. Most were held in Lety or a similar camp in the south Moravian town of Hodonin u Kunstatu, where 207 prisoners died. The Hodonin camp site has drawn less international attention as it is now home to a sport and recreation complex, a less dramatic affront to the Roma than the presence of the Lety pig farm. But when these camps were shut down, the remaining internees from both were transported to the so-called Gypsy Family Camp at Auschwitz-Birkenau, and to other Nazi extermination camps like Treblinka. Few survived. 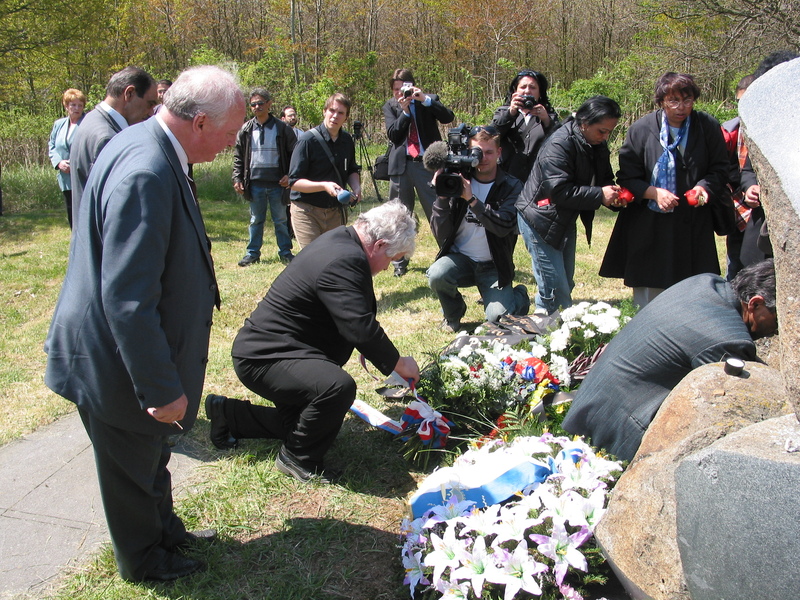 A decade ago, the celebrated human rights activist and former Czech president Vaclav Havel laid the first wreath at the Lety memorial. On Saturday, a leading Czech daily published an interview with President Vaclav Klaus, Havel's successor and long-time ideological rival, in which Mr Klaus spoke not of genocide, but of a camp "for those who refused to work". 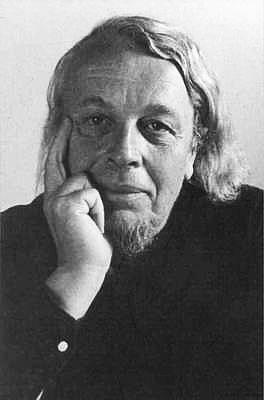 President Klaus told the daily Lidove noviny that Lety "was not a 'concentration camp' in any proper sense of the word". "Concerning the first two years of the camp, it was in fact, a camp for adult men, but we are very embarrassed that the president actually quoted or repeated what the Nazi terminology in stating that the people were put to the camp because 'they refused to work'. The [Roma] people were sent there because they were different", says Pape. Some 497 Euro-MPs voted in favour of the non-binding resolution, which in main part called on European Union member states to coordinate a strategy for integrating the Roma into society. Of the 25 who voted against the resolution, almost half were Czech. 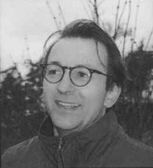 Nine were members of the Civic Democrats, the centre-right party of which Mr Klaus was chairman. 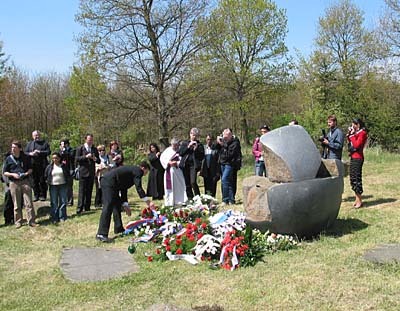 For those Czech officials and politicians who want the state to pay for the removal of the pig firm, and build a proper memorial there to Roma victims of the Holocaust, Lety is the site of a "concentration camp". "Discussions about the nature of the camp, if it was a concentration or labour camp are absolutely... it's a nonsense", says the vice president of the Czech senate, Petr Pithart, was among the non-Roma dignitaries on hand for Friday's memorial service at Lety. "[To say] 'It was something special, only for Gypsies, and was not a 'concentration' camp'. It's absurd, absurd.' It was a camp from which 600 people were sent to Oswiecim (Auschwitz) so it is a concentration camp". Those opposed to the removal of the pig farm, including President Klaus, say the estimated million it would cost to remove the farm and compensate its owners would be better spent, for example, on programmes to help educate the Roma. "It's a pity that Lety has become a field for fights between [political] parties and in the first place there are not deep feelings for the victims and their descendents", Pape says. 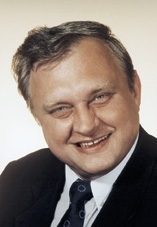 President's Klaus' words echoed those of the Czech Communist Euro-MP Miloslav Ransdorf, who also voted against the Resolution. "This mention of Lety camp [in the European Parliament resolution] was a provocation," he said. As a historian, says Ransdorf, he knows that "outrageous lies have been spread about Lety" and insists that there was never any genuine concentration camp there, but rather a reception camp. "There was no concentration camp in the real sense in Lety; there were no gas chambers in Lety. So the fact that Mr [Milan] Horacek from the Greens introduced this item into the debate of the European parliament was a provocation, from my point of view", Ransdorf told Radio Prague. The former Czech human rights commissioner Petr Uhl, who had recommended in a 1999 motion to the Czech Parliament the pig farm be torn down, has lodged a criminal complaint against MEP Ransdorf for "denying the Holocaust". "I have asked the state prosecutor to take him to court for denying the holocaust and genocide. In most of Europe, this is a criminal act," Uhl said. "In the Czech Republic, it has been a criminal act since the 1 April 2000, and it is not only about denying the Holocaust, but casting doubts on what happened. And Ransdorf's statement that there have been 'lots of lies' about Lety falls into this category of holocaust denial". In November 1939, Nazi officials in Prague issued an order for all Czech "Gypsies" (Roma) to settle permanently within two months' time. Adult men and women who didn't comply with the order, or who couldn't prove they earned a "respectable" living, were rounded up by local authoritiesCzech and Germanand sent to the purpose-built camps of Lety or Hodonin. 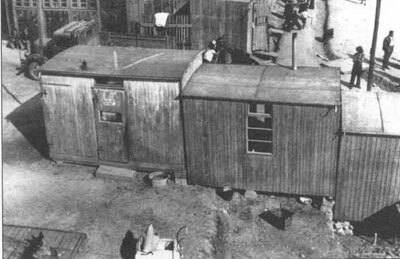 According to an exhaustive study by the Czech historian Ctibor Necas, it was not until May 1942 that large numbers of sedentary Romadeemed "asocials" by the Naziswere locked up in these purpose-built "labour" camps, whose population had long since become overwhelmingly Roma, and in the official Nazi lexicon, were now "internment" camps. By early 1943, German and Czech authorities had registered 5,830 Gypsies and part-Gypsies living in the Czech lands. Within six months, the majority had been forcedtogether with their familiesin the so-called "Gyspy camps" which had been set up by a further change in status of the internment camps of Lety and Hodonin. "There is enough documentation proving that Czech police were searching for the Roma; they were arresting them, deporting them, controlling them. And anywhere where people are concentrated in a group, where instead of in a barracks made for 150 people there are 1300 people, then there shouldn't be attempts to call it something else than a concentration camp, or to say that people were 'only' dying of typhus and to deny the suffering and history, especially of those who are, thank god, still alive", says MEP Milan Horacek, a co-sponsor of the Resolution in question, who represents Germany in the European Parliament, but was born and raised in the former Czechoslovakia. He notes that 150 Roma children died within a six-month period of internment at Lety, and that there is documented evidence that the Czechs officials who ran the camp withheld medical treatment when it suited them. "None of us have claimed that Lety was an extermination camp, but the survivors were sent on to various extermination camps". "I really do not care for the statements of Ransdorf and Klaus. 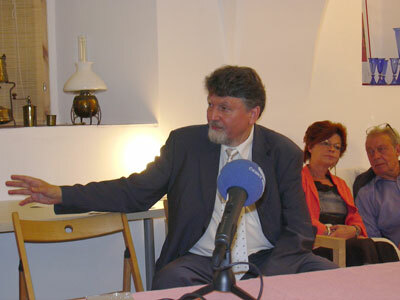 I think they are neither sensitive nor accurate", says the current Czech human rights commissioner, Svatopluk Karasek. He says he is hopeful that the European Parliament resolution will "inspire" the Czech Republic to remove the pig farm, which he called a symbol Czech society's relationship with the Roma minority. "In my opinion, since 1942 Lety was a real concentration camp--not only an internment camp or labour camp for those who did not want to work--because, for example, 150 children died there in half a year's time, and in my opinion, this was a camp whose aim was to systematically liquidate Roma in the Czech lands and that it was a Holocaust".